Having Fun With Open Face Chinese Poker! Online OFC poker rules and more! Open Face Chinese poker is a highly addicting game, and I fell in love with it the first time I tried it out with my friends. It has many exciting variants such as regular Chinese, Pineapple and probably the most popular is OFC poker, which is quite different from standard Texas Holdem poker rules. Therefore, we will talk more about it a bit more. Knowing that the game has many formats, you can even choose what you like more and can jump straight into playing it. 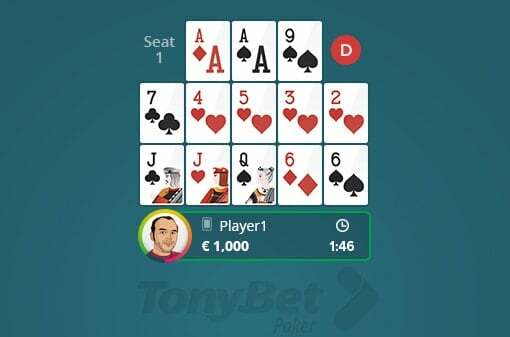 Sadly, you will not find many online poker rooms offering these games, and if you want to try it out your only reasonable and by far, the best option is Tonybet Poker. Even if you never played poker before you can easily learn this game because it is quite different from other games and you will not have a big disadvantage against more experienced players from other formats. You do not need chips, and there is no betting going around as you are used to seeing in other poker formats. The whole thing is based on points, and all you have to do before starting the game is to agree on the value of the point, and it will determine how much you will win or lose. Middle hand has 5 cards, and you have to make a hand, which is stronger than the top line, but weaker than the bottom. Bottom hand has 5 cards and has to be the strongest hand from all three. If you do not follow this rule, your fault the hand, and lose at once without getting any points. Therefore, you need to think in advance and carefully consider your decisions not to make that mistake. The first thing you need to do before starting the game is to agree on the point value. Let us say you decide that each point is worth $5 so you just multiply your points after the game, and you will have net result how much you won or lost. Therefore, if you gained 8 points, you will get $40 as profit from that hand and will begin next hand from scratch. As I mentioned before, there is no betting or raising in OFC poker, so your point count will determine everything. The game starts when you draw the Button, and you continue further like in any other poker game by moving the Button one spot to the left every hand. When you start playing, you are dealt your first 5 cards, and you have to set all of it in any way you like, be it all in one line or to add cards in all three lines of your hand. Just a reminder that you have to follow before mentioned rule of making your strongest hand on the bottom line, second strongest in the middle and weakest on the top line. After every player positions first five cards everyone draws 1 additional card in turn and put it in any of his three hands. You continue doing that until you finish filling all 3 hands and use those 13 cards. When all cards are set, you have to compare your hands versus other players. To count the score, you compare your Top hand to another player’s Top hand, Middle hand vs. Middle hand and Bottom hand vs. Bottom hand of each of your opponents. Then you start counting the points. As I mentioned before, you compare all your hands separately, and for winning a hand, you get 1 point. If you win all 3 of your hands or your opponent faults, it is called “SCOOP” and you get 3 additional points, making it 6 in total. However, if you win two hands, and lose one, it nets to just 1 point. Taking the same math you can end up with a negative balance as well, so if you lose all 3 hands you will lose 6 points, and if you lose two and win one you will net a loss of 1 point. On top of that, you can get extra points, which is called “Royalties” for making big hands. The point value for every hand is given in the following tables so you can easily see how many points you can get for making a particular hand in each of the rows. The last and probably the most fun thing that you need to learn is “Fantasy land”. This is the name of the bonus, which you get after making QQx or better on your top line without faulting it. If you can make it, then on the following hand you will be in a fantasyland and be dealt all your hands at once. It gives you a huge advantage over your opponents, and if that is not enough, your opponent has to play the hand in a regular way before seeing any of your hands making his life very tough in this spot. To stay in fantasyland, you need to make trips on your top line, fullhouse or better in middle one or quads or better on the bottom hand. When you finish fantasyland, you just compare all hands against your opponent like in a regular way and count the points. Just a quick note about fantasy land, if you get this bonus next hand is mandatory for your opponents, and they can’t quit until you finish it. It goes for everyone, when any player is in the fantasy land no one can exit the game until the next hand is played out. Like in all formats of poker, math plays a huge part in making the right decisions and open face Chinese poker is not the exception. However, I can give you some good news here. It is quite easy to learn, and Tonybet has it explained very clearly on their site. Make sure to check it out before playing, and you will become a solid player very fast. If you want some tips about poker math for other games, I highly recommend reading my article about poker odds and improving your game even further. Everything starts line in a regular game, but instead of drawing just 1 card after placing 5 initial cards, from the second round you draw 3 cards and have to put two of those in play and discard one face down without showing it to anyone. Another huge difference occurs in a fantasyland. When you reach it, you get 14 cards instead of 13 like in regular OFC poker game. It could look like a small thing, but it is not. It gives you an even bigger edge, and you can choose which hand to discard while still using the rest 13. This considerably speeds up the action and makes it even more fun. Therefore, it is my favorite open-face Chinese poker format, and I enjoy it as often as I can. As mentioned before you do not have many places to choose from and by far the best option is Tony Bet poker. It was the first room, which offered these games and was able to attract many recreational players who are quite easy targets even without using any poker software to take advantage of them. Therefore, you can make some nice cash while having serious fun and that is always nice. For the same reasons, I believe you will always see new recreational players coming to these games making it worth to learn the rules and at least try it out. If you want to find out more about this room, take a look at TonyBet poker room review and make sure to join that fun. They offer regular games and big bonuses, so you will not make a mistake by checking it out. Moreover, if you are still seeking to improve your Texas Hold’em game, you can get the best poker tips, enroll in poker strategy video courses or even take private coaching and become the best you could be!